The Department of Justice has finally admitted that they provided Congress with inaccurate information about the gunrunning operation, Fast and Furious, which claimed the life of Border Patrol Agent Brian Terry. TexasGOPVote blogger Bob Price reported on Brian Terry's death, as well as drew a connection between the death and possible government cover-up long before the mainstream media picked up on it. Almost a year ago now, Senator Chuck Grassley sent the Department of Justice a letter asking for information about the operation. 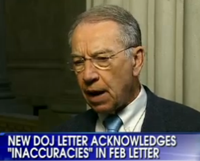 Senator Grassley went "On the Record" last night to discuss further explaining, "Well, it looks like now they are being deceitful from this standpoint that we knew that they knew about it. They sent us a letter and said that none of this was true. They sent us basically two letters that none of it was true and finally it was nine months before the hearing that -- before our Judiciary Committee that they admitted that that letter of February 4th contained false information." Until this day, no one has come forth to take responsibility or apologize for this operation that went wrong. Attorney General Eric Holder is expected to come before the Judiciary Committee in the House of Representatives this Thursday, December 8th. The Murder of Border Patrol Agent Brian Terry - Is the Government Covering Something Up with its Silence? US Attorney to Deport Three Suspects in Brian Terry Murder - Getting the Witnesses Out of Town?? Brian Terry Murder - Mainstream Media Comes on Board... FINALLY!